If you search “appendix IWB holsters” on the internet, you will surely encounter the G-Code HSP INCOG and the PHLster ACCESS/Skeleton. I decided to get both, and decide which one I might like better. I picked the ACCESS over the Skeleton because I prefer a shirt guard for my holsters. * Keep in mind that the comfort of carry is quite subjective, and different body-types would find different holsters more comfortable or not. * Also, PHLster focuses on making holsters for Glocks and M&Ps. 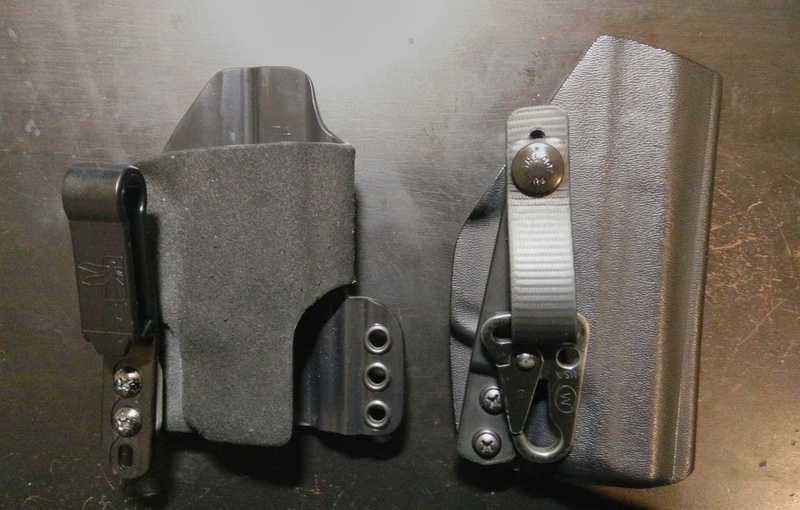 If you have a handgun from another manufacturer, AND live in the Philly area, you could possibly go to their workshop and have a custom holster make for your handgun. * For a comparison between the INCOG and the INCOG Eclipse (mod version), read this post. Left: HSP INCOG (half guard, 1 belt-clip only); Right: PHLster ACCESS + ITW Snap hook for keys.